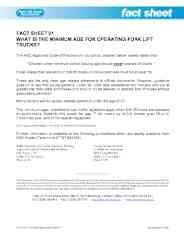 FLTA (Fork Lift Truck Association) Fact Sheet detailing minimum agree requirements for operating forklift trucks. Got some questions? Need advice? Get in touch with us. Copyrights © Independent Handling & Driver Training Ltd 2003-2019. All rights reserved.